The OnePlus 6T launch could be under two months away. The OnePlus 6T launch date is probably not too far off, and we’re starting to see more and more OnePlus 6T leaks, and actual facts, appear online. Just recently we’ve seen OnePlus confirm that the 6T will boast an in-display fingerprint scanner as it ditches the headphone jack – two major moves for the firm. Update: OnePlus has exclusively confirmed that its next handset (rumored to be the OnePlus 6T) will not have a headphone jack, but will feature improved battery life. It’s also just launched a USB-C version of its Bullets V2 headphones. While a six monthly flagship turnaround may seem a bit quick, it’s fast becoming the norm with the likes of Samsung, LG, Sony and Huawei all launching a new premium device twice a year. It’s no surprise OnePlus does too, and the OnePlus 6T will actually be the firm’s ninth handset in its short 5 year existence. We’re pulling together all the OnePlus 6T leaks, rumors and facts below, plus we’ve also had a think about what we’d like to see from the new OnePlus phone. The OnePlus 6T release date is likely to be around November 2018, as that’s when the OnePlus 5T arrived last year, and the OnePlus 3T in 2016. It would be the firm’s third ‘T’ variant device, as it looks to bridge the gap between its new-number launches in June. The OnePlus 6T may arrive a month earlier though, with a separate report claiming that the handset will launch in October. Reports that suggest the OnePlus 6T may not launch this year can be ignored, as OnePlus has started confirming features of its upcoming smartphone, which means a launch is imminent. Whether it’s an October or November launch, we can be pretty sure the OnePlus 6T release date won’t be too long after its unveiling, as the firm doesn’t generally hang around opening up pre-orders and subsequently shipping the first devices. There’s no word currently on the OnePlus 6T price, but the OnePlus 6 started at $529 (£469, around AU$840) and prices have been gradually creeping up since the range debuted back in 2014. We expect the OnePlus 6T will cost at least as much as the OnePlus 6, but with the confirmation of an in-display fingerprint scanner for the handset the price could be pushed up again to accommodate the new technology. While the OnePlus 6T price may rise, it still won’t be anywhere near to the likes of the iPhone XS ans Samsung Galaxy Note 9. In the US you may be able to buy the OnePlus 6T from a carrier for the first time, as OnePlus has said it’s looking into it, and a more recent rumor suggests the Chinese firm will open up a partnership with T-Mobile US. The OnePlus 6T might not be official yet but some features are, as OnePlus has confirmed that the phone will have an in-screen scanner called Screen Unlock. OnePlus has revealed that as a result of the OnePlus 6T boasting an in-display fingerprint scanner, it will be 0.45mm thicker than the OnePlus 6, presumably making it 8.25mm thick overall. Apparently the phone will also have a more unibody design than its predecessor. The company didn’t say anything else about the design, but we have seen several photos seemingly showing the retail box, which handily also includes a sketch of the OnePlus 6T. That sketch shows a small waterdrop-like notch at the top housing a single-lens camera, a slim bezel below the screen and a fingerprint icon on the display, hinting at the now-confirmed in-screen scanner. The images, which you can see below, don’t show the back of the OnePlus 6T, but that design is more or less identical to the Oppo R17 and Oppo R17 Pro, and there’s reason to believe that the OnePlus 6T could share several of the features found on the Oppo R17. That’s because previous OnePlus handsets have bore more than a passing resemblance to Oppo phones (both manufacturers are owned by the same firm), so the link here isn’t all that hard to fathom. 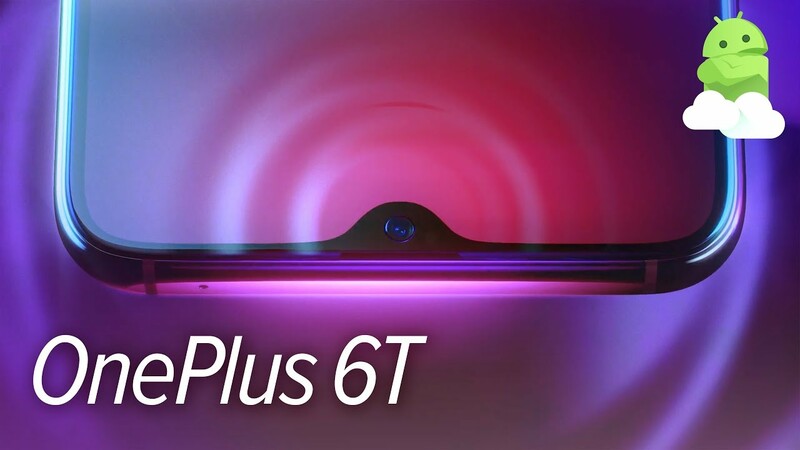 That might mean that the OnePlus 6T has a 6.4-inch Full HD+ screen, 8GB of RAM, a 25MP front-facing camera and either a 16MP/5MP dual-lens rear camera or – more likely – a triple-lens one, like the setup found on the R17 Pro. That phone has a 12MP variable aperture lens which can switch between f/1.5 and f/2.4 apertures, a 20MP f/2.6 lens and a ToF (time-of-flight) 3D stereo lens. That last one can measure depth, making it useful for both the ever-popular bokeh/portrait mode and augmented reality. Other than those rumors, we can guess that the phone may well have a glass back, since OnePlus only recently switched to glass with the OnePlus 6. Also Read: Google Pixel 3 Leaks. #OnePlus 6T power and performance. The OnePlus 6T is sure to have the best Qualcomm Snapdragon chipset available at the time along with masses of RAM (the OnePlus 6 came with a choice of 6GB or 8GB). It won’t have one. OnePlus co-founder Carl Pei has exclusively confirmed to TechRadar that its next handset will drop the headphone jack. OnePlus believes now is the right time to remove the jack, and it’s allowing it to bring new technology to the handset (such as the leaked in-display fingerprint scanner) as well improved battery life. Along with an all-screen design we’d like the OnePlus 6T to have an in-screen fingerprint scanner. That way the phone could still have a scanner without it having to be awkwardly placed on the back. And in-screen scanners are currently a high-tech novelty, and having one could help the OnePlus 6T stand out from the crowd – or at least match up to it, depending on how many phones have them by the time the OnePlus 6T launches. The good news is that since we added this to our wish list OnePlus has now confirmed that the 6T will have one. For more leaks and news stay tuned with us.